Wildhorsecamp specializes in horsemanship! 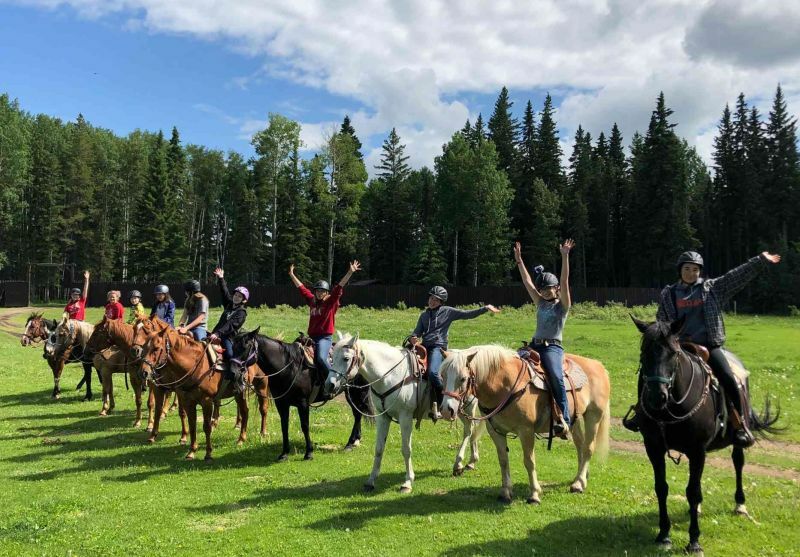 Wildhorse Ranch provides opportunities to build self-confidence, resiliency and self-esteem through working with the horses and taking part in land based learning. We have caring, well-trained staff and horses. Welcoming horse crazy girls from 11 – 17 years old, from beginners and up. Pick your own horse out of our herd and make life long memories! Choose the right sessions for your child. Filter by activities offered or search by dates below. As parents of girls that visit your camps on a regular basis we are forever in your debt! You are the ones that provide a safe & enjoyable retreat for our girls that takes them to a place that they can forget about the turmoil’s of the world and concentrate on something that they are all passionate about! You are true Heroes! Just Ride! Words cannot describe this camp. Fun – an understatement, incredible – just not good enough. This camp was Heaven on Earth. I love my horse and I never want to leave. You guys and your ranch bring so much peace to me, and I am sure I can speak for the other girls as well. Thank you again for a truly unforgettable experience and you can count on seeing me out and riding with you again! Horses! Horses! Horses! I have been a horse crazy girl all my life and I am passionate about giving girls an opportunity to spend time "immersed in horses"! 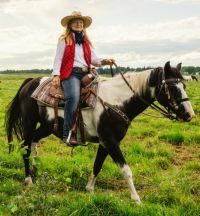 I see a great need to reconnect to horses and the land, to put away the cell phones and just play on the ground and in the saddle. When we walk on the land and feel the earth, when we touch and hug the horses there is an emotion that comes up in us that gives us a sense of connection - One Earth One People. Girls that attend camp often make life long friends and they reunite each year at camp for a joyful week of "catching up". My desire is to empower girls to have them set goals, dream big dreams and reach for the stars! "People may not remember what you did, or what you said, but they will always remember how you made them feel." Whisper and Mackie and their Life Long Friendship! I caught him and brought him up to the barn, Mackie saw him coming and his head came up out of the hay and he gave his friend a big whinny of welcome! Whisper on the other hand gave a half grunt/whinny that was more like "where have you been, I've been worried sick because I could not find you! You could have let me know you were leaving..and there was probably a bunch of swearing thrown in on the front end..."
Seeker ( aka Crazy Horse) bought at a select Quarter Horse Sale - something we seldom do, mostly we buy by private sales. He has been a work in progress, bought almost 5 years ago as a well trained rope horse/seasoned gelding anyone can ride... now how many times have we seen/heard that statement? What we have come to realize is that as soon as a horse leaves his previous owner there can be a huge adjustment for him once he arrives at his new place depending on so many variables. Usually we can only guess by their behavior/personality what their previous life was like. In this case Seeker withdrew from life in general and did not want to have anything to do with anybody, he put off a very big "Don't touch me"! So we slowly introduced him to the big herd and then turned him out and left him alone. He stayed way off by the forest, or just on the edge of the herd when the feed tractor laid out the hay for the day. Aloof and alone he watched, sampled the energy of the ranch and continued to stand reserved and wary on the edge of life. Gradually the calming power of the herd broke through his shell and he started coming up to the feed wagon and he allowed Bear to touch him. Since that day we have seen a horse riddled with so many trust issues that we can only guess at the things that he must have faced.. so much like humans in similar situations the triggers are sometimes buried very deep and when they come out - look out! Needless to say he is back in a program where he is a ground work horse teaching people compassion, empathy, trust and understanding. A powerful job for a powerful horse! We have seen many people spend time going to counselling and listening to the "words" but things never change for them. We have also seen people who have come to the ranch to "get away from it all" and they end up with their arms wrapped around the neck of a beautiful, kind, caring being who in silence can be more effective than all the words in the world... Letting emotions bubble out and out and release the pressure is very healing. Spending time with horses can be life changing! No riding required. Many thanks to Seeker for the lives that he has touched.